Rather belatedly, here are the photos from Day 2 of my mini-break to Llandudno, which was over a week ago now. After dropping G off at the college where he had meetings all day, I first went back to the motel and worked for a bit. Then I packed everything into the car, checked out and headed to Llandudno for some shopping and wandering about looking at things. Purchases were totally boring, including new shirts for G and new undies for me. Shopping accomplished, I went for walk to the pier, then up through Happy Valley to the Orme. 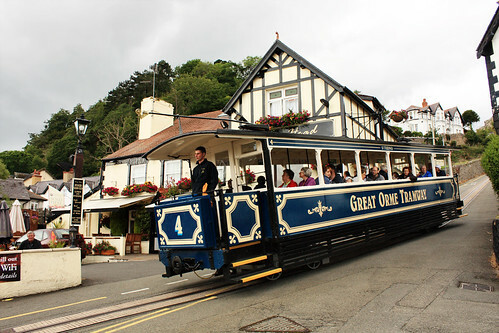 I remember this cable car opening when I was working in Colwyn Bay during the summer holiday in between the lower and upper sixth. It must have been about 1969. I'm please to see that it's still running. I didn't go right to the top because a) I didn't have time and b) I was only wearing sandals, but the cable cars are sailing on towards the summit. 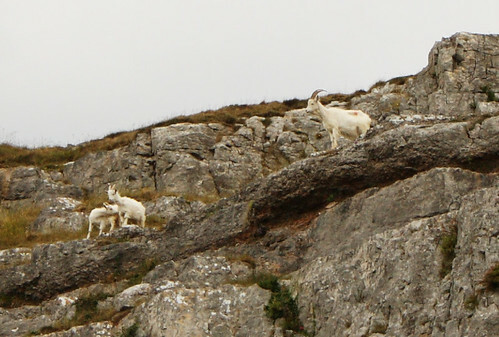 I don't remember ever seeing the Kashmir goats when I used to come here as a child and made our annual pilgrimage up the Great Orme. However, they have, apparently, been here for over 100 years. Perhaps they were shyer in those days? Perhaps the herd has expanded and it's easier to see them? Anyway, this is not a good shot at all because I didn't have the camera with the zoom lens and had to crop right down to make them look more than tiny white dots! 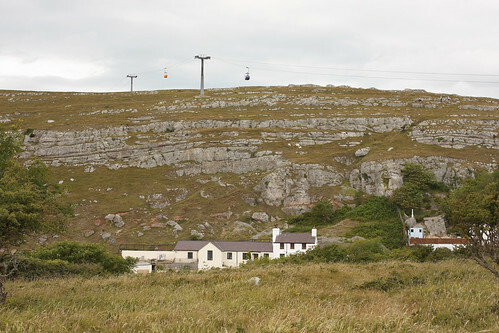 There are actually three ways to get to the top of the Great Orme. You can walk, you can take the cable car, but much older than the cable car is the tramway. 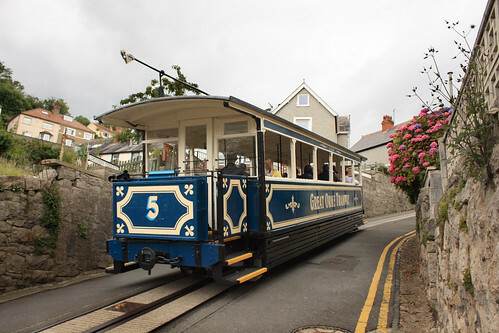 Here a tram has just passed me and is climbing up the steep road out of the town to start the long climb up to the top of the Orme. The cable car only goes part way, then passengers have to change to a rack and pinion tram for the final stretch. Shortly after the tram passed me on its way uphill, another came down, heading towards the terminus which is not far from this point. Wow, fantastic photos. Love the trams - so colourful. 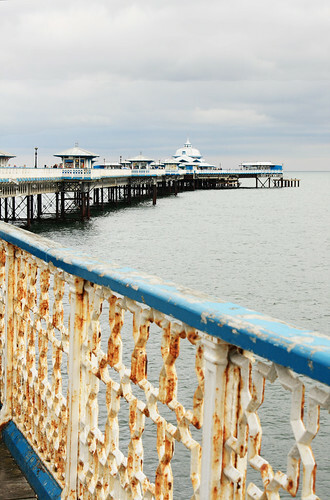 Also the rusty railings in the foreground of the pier - great shot. You really are an excellent photographer Helen. It isn't just the clarity; it's the shape & composition. A real treat. Thank you. I particularly like the goats! I'll probably find out the answer in another post, but... Did you visit the Bronze Age copper mine??? When I was a child, Happy Valley, with the "Alice in Wonderland" figures, was the absolute highlight of any trip to Llandudno. I haven't been there for decades. Nowadays, Llandudno is where we take Mum shopping, though we did have a family game of Crazy Golf at the top of the Orme last year.